My Project Manager came home the other day with a 'present' for me - a 'present' that was the product of his good idea and had me rolling my eyes! He had bought me several tubes of caulk (sounds like chalk). It was to be MY task to go over ALL the uneven walls and joins with the caulk, filling and smoothing to create a flat base for painting. I'm not sure why he's come up with this when we have plastered and painted all but the hall - even at 'just the hall' it's still a daunting task! He was also kind enough (dripping with sarcasm here) to buy me a selection of flat tools for applying the stuff. Great. 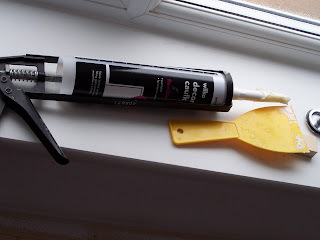 I started using the caulk in the bathroom (my aim this week is to finally complete the family bathroom) - and I became hooked in an instant! 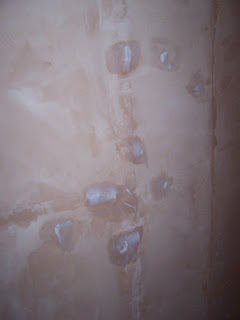 It's like gloss painting, hugely satisfying to smooth over any cracks and dips. It fills the tiny millimetre gap between skirting and wall, fills knot holes in wood and can then be painted over. And it's very cheap. It's my new hot tip for those of us that have (DIY) lumps and bumps in all the wrong places!